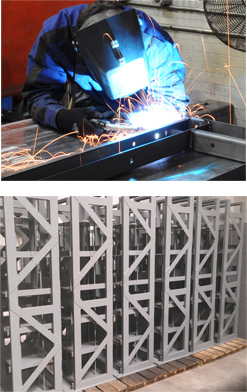 Many sheet metal companies subcontract out their welding or perform the basic box assemblies in house. At Serco Mfg we take it to a much higher level above just the standard ferrous MIG welding. We perform TIG welding, MIG welding of Aluminum along with robotic welding of AL, Steel and Stainless Steel. We design our own fixtures in 3D models and can fabricate and machine the fixtures as needed to handle the medium to higher volume jobs especially when we provide deliveries to customers who need their weldment assemblies delivered consistently on time.